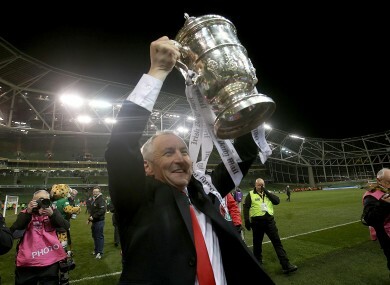 John Caulfield celebrates with the FAI Cup trophy. CORK BOSS JOHN Caulfield was in jubilant form after seeing his side clinch a late winner against Dundalk in yesterday’s FAI Cup final. However, it was deep frustration rather than elation that Caulfield was feeling at half-time of the match at the Aviva Stadium, as Dundalk dominated possession and territory, while the Leesiders offered very little in an attacking sense. “It was a game like two heavyweights — first half we were very nervous and stood off them. I don’t know why. “Second half, we were fantastic. We totally dominated the match and created some chances, and Gary Rogers probably made the save of the match. Caulfield admits he reprimanded his underperforming side at the break owing to their poor first-half showing. I had a word with the lads (at the end of the first half) because we were awful. We were standing off and weren’t pressurising and we weren’t like ourselves, which was a bit like last year (in the FAI Cup final). There were a number of heroes in the Cork side who earned their fourth win against Dundalk in six attempts this season, with 35-year-old defender Alan Bennett one of the players who stood out. “He was going for the ball all day, and you want that. Nowadays, sometimes it can go against you, but to be fair, he’s a phenomenal player, a war horse. He doesn’t train all the time with his age, but week after week, just gets himself on that pitch to perform. He was outstanding in last year’s cup final, and today he was immense. I’ve said all along, this team is an outstanding team and hopefully winning the cup will give the belief to the players to move on, because obviously the standard Dundalk are at is phenomenal. We’ve been close but people had been saying that we hadn’t won anything, which is true. “Even for myself it’s frustrating that we hadn’t, because you put in so much effort. The night we came home from Dundalk where we had a bad night in the league, we said ‘lookit, just make sure we go to the cup final and leave everything there,’ and today they just left everything on the pitch. Along with Bennett, another veteran drew high praise from Caulfield — 36-year-old former Ireland international midfielder Colin Healy, who was introduced as an extra-time substitute and made an impact in the short period in which he was on the field of play. The Leesiders manager afterwards paid glowing tribute to Healy amid speculation that the ex-Celtic and Sunderland player is set to announce his retirement. Everyone knows he was one of the most unfortunate footballers when he was in England with leg breaks, because he’s an incredible player. I was fortunate when I took over the club that he was at the club and I think the first year we were there he was fantastic behind the scenes, he was a phenomenal person. Training every day, phenomenal. I said to the young players, look at the way he trains, look at his attitude. “There are a lot of players in this country who are called professional but don’t act professional. You need to train six days a week and twice a day, Colin Healy is an absolute phenomenal person at training. I always keep saying our young players to look up to him the way he does it, never sloppy. He’s always up for it, never in bad form, so it was fitting for him to come on today as the game got stretched and we got tired. He came in and made some unbelievable interceptions. There was one tackle he made on Daryl Horgan, when Daryl looked as if he was in, but overall, he gave us that composure and those legs. The 52-year-old coach, who made over 400 appearances for Cork as a player between 1986 and 2001 and has been manager of the club since 2013, savoured their third FAI Cup final win and also explained how he used the fans as inspiration for the players prior to the game. It’s just a phenomenal feeling. You give your life to this… It affects everyone, it affects your family. People give their opinions about you, they don’t realise the work that’s gone into it, the hours spent on video analysis, preparation, getting everything right down to the finer details — the bus, the music, getting lads’ gear ready. Today certainly made it all worthwhile. “Some supporters can be fickle, but since the first day, I’ve got nothing but absolutely outrageous support, every day walking around Turner’s Cross, the city, the county. People have said others are out to criticise me, but I haven’t seen it. The support I’ve got has just been phenomenal. The people have appreciated since the club went down in 2010, when we came back, we just hadn’t been challenging. They just wanted us back up there and they’ve known the last couple of years we have been back up there and doing great, but obviously you want a win and I’ve said that to the lads before the match. Email “'You give your life to this... It affects everyone'”. Feedback on “'You give your life to this... It affects everyone'”.